Mount Erebus is an alkaline stratovolcano just off the shore of the Antarctic main land (77 33'S, 167 10'E). It is notable for its persistent convecting lava lakes with Strombolian eruptions projecting bombs up to 10 m in diameter in the last decades and its size—at 3794 m above sea level and ~200km km^3 in volume, it is among the largest volcanoes of the world [Zreda-Gosrtynska et al.] [Csatho et al.]. Furthermore, irony has it, it is relatively easy to access. It has thus been subject of extensive research. Cameras, microphones, seismic equipment as well as scientists from a wide range of fields all monitor mount Erebus [Oppenheimer and Kyle]. The volcano and its neighbouring mountains, mount Bird to the north and mount Terror to the east, all reside on Ross Island . They all are though to be the product of crust thinning overlying a strong thermal anomaly and are consistent with a hotspot/mantle plume model. To the south, geological similarities suggests that brown peninsula would also have been a the product of the hypothesized Erebus hotspot. Ross island itself is on the extensional rifting margin of the West Antarctic Plate, the north eastern terminus of Terror ridge. The age of the plume correlates both temporally and spatially with the Terror rift (see side note) [Kyle et al.]. 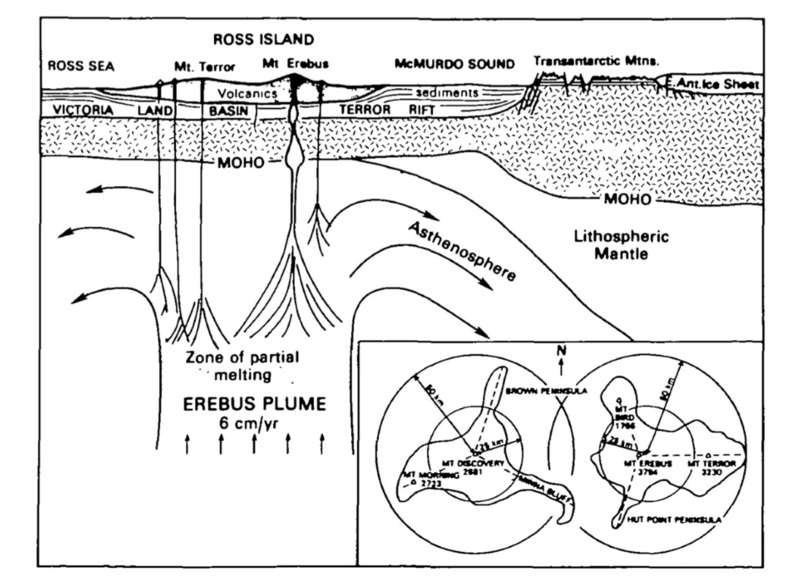 Shematic illustration of the Erebus volcano show the tectonic setting . The Erebus plume lies exactly under the volcano. Also, a radial distribution (one central crater radially surrounded by tree arms) consistency may be observed between Ross Island and Brown Peninsula. The surface geology of the volcano is almost entirely phonolitic anorthoclase. Seismic velocity surveys suggest a thick layer (~5 km) of solidified phonolitic lava flows overlying cenozoic sediments and a basaltic basement [Dibble et al.]. The lithology points to a three stage building process: the shield building stage where the mantle plume would have been protruding the crust, a cone building stage where evolved lavas would have formed the flanks of the volcano and finally a marked increased lava forming stage forming the bulk of mount Erebus [Harpel et al.]. Upon the discovery of the Erebus volcano by Ross and his crew in 1847, reports describe an explosive eruption. Tephra stratigraphy is consistent with Ross' observations and further suggests that the volcano's geological history is marked by explosive eruption events and is further reflected in the concentric caldera patterns [Harpel et al.]. Simply said, Mount Erebus provides an ideal proxy for the study of volcanoes; relatively simple mechanisms drive rare, accessible and spectaculars geological features [Oppenheimer and Kyle]. Csatho, B., Schenk, T., Kyle, P., Wilson, T., Krabill, W. B., 2008. Airborne laser swath mapping of the summit of Erebus volcano, Antarctica: Applications to geological mapping of a volcano. Journal of Volcanology and Geothermal Research, 177 (3), 531-548. Harpel, C. J., Kyle, P. R., Dunbar, N. W., 2008. Englacial tephrostratigraphy of Erebus volcano, Antarctica. Journal of Volcanology and Geothermal Research, 177 (3), 549-568. Kyle, P. R., Moore, J. A., Thirlwall, M. F., 1992. Petrologic evolution of anorthoclase phonolite lavas at Mount Erebus, Ross Island, Antarctica. Journal of Petrology, 33 (4), 849-875. Zreda-Gostynska, G., Kyle, P. R., Finnegan, D., Prestbo, K. M., 1997. Volcanic gas emissions from Mount Erebus and their impact on the Antarctic environment. Journal of Geophysical Research, 102 (B7), 15039-15. Oppenheimer, C., Kyle, P., 2008. Volcanology of erebus volcano, antarctica. Journal of Volcanology and Geothermal Research, 177 (3), v-vii. Dibble, R. R., O'Brien, B., Rowe, C. A., 1994. The velocity structure of Mount Erebus, Antarctica, and its lava lake. Antarctic Research Series, 66, 1-16. Giggenbach, W. F., 1976. Geothermal ice caves on Mt Erebus, Ross Island, Antarctica. New Zealand journal of geology and geophysics, 19 (3), 365-372.